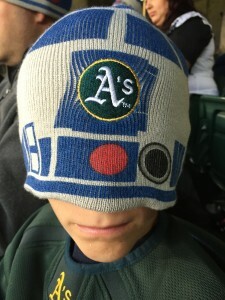 Wear an oversized Oakland A’s R2-D2 hat if you want. There are no rules here. I have a school clothing rule: no logos or characters on shirts, and no basketball shorts. I don’t see any reason for elementary school kids to be walking billboards for brands, or for them to look like they just rolled out of the gym. Once Memorial Day hits, all bets are off. The end of school is in sight. Rules go out the window. The Assistant is down to three plain tees that aren’t pilled, stretched, holey or just plain worn out. And because he’s so darned skinny, I buy shorts on an every-other-year program, meaning that his size 6 and 8 shorts still fit at the waist, yet he needs a 12 in length. He looks a little bit ridiculous. So this week, he can wear whatever he wants. Rocket shirt? Sure. Abbey Road tee? Fine. Bizarrely small, supposed to be adult-sized Hackaday shirt that The Husband got from Shenzhen in 2014? Knock yourself out. But the finish line is in sight. We’re down to eight and a half days of fourth grade. Science Olympiad is done. Chess tournament is next weekend and then we just cruise to the finish. It’s been a good year, so much better than third grade and proof that the teacher makes all the difference in health and happiness. I have great affection for his teacher and the way she has restored his confidence over the past nine months. And I’m so glad that she chose to take on this crazy job at this crazy school, in spite of its requirements of taking fourth graders on three-day trips to Gold Country. And so, we look toward the finish, wearing whatever the heck he wants to wear, and reveling in the fact that the end of school is within reach.